Singaporeans, please don’t fall for it. I have said it again, and I will say it again. This Singaporean vs foreigner sentiment is a gimmick, it’s a ploy. Please, I don’t know how many times I need to say this, but we need to remember who we are directing our unhappiness to. It is not to the foreigners. Singaporeans, the reason why there will be too many people on this small island of Singapore is because of a government who has implemented bad policies which have not been properly thought out by them. The reason why this country is too crowded is because this government has made population projections, which they couldn’t adhere to, and where the actual numbers ran out of proportion, and where because they didn’t plan properly, there simply isn’t enough infrastructure and diffusion of spaces to keep up with the speed of population growth. This government has bad planning, bad foresight and bad policies – now, let’s get this right, please. Who is to blame for the current problem? If there are good policies that are enacted, what do you think will happen to Singapore? We will have a more moderate flow of people coming in and going out of Singapore. The growth of the population will be more balanced and measured. And we will not be in a state of unhappiness. So, what is the problem? The government’s policies of managing the flow is flawed and not thought out carefully. 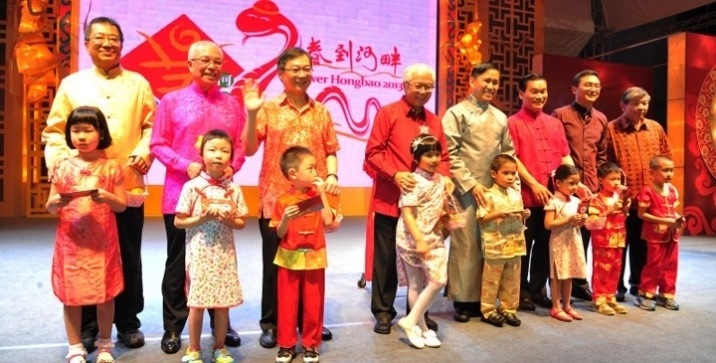 The government’s responsibility is to maintain and upkeep the social fabric of Singapore. As a citizen, it is our right to ask – how dare PAP bring in people without any consideration of the well-being of all the people that will reside on this island? How dare PAP not come out now and firmly put to rest the discussion about Singaporeans vs foreigners, by apologising for their bad policies. PAP needs to amend this policy, and not simply retain the policies and put unnatural curbs on the number of people coming into Singapore, without any other adjustments to business costs or wages. This has thus not only resulted in a twin problem socially, but also among businesses, who are thus stifled. 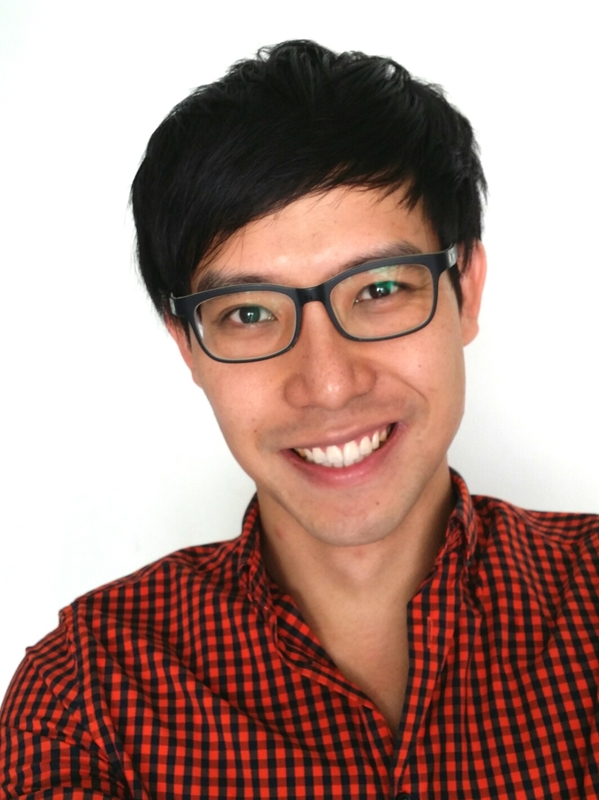 Why are foreigners getting the flak in the discourse of Singaporeans vs foreigners? PAP lured the foreigners to come into Singapore, and then left them in Singapore to fend for the criticisms that they are facing, in large part because PAP could not plan their policies well and resulted in over-crowding. And why are the foreigners left to pick up the pieces while PAP continues to sit on their high horse, planning for more people to come in, which will allow for more foreigners to be verbally abuse, and possibly in other ways? They didn’t ask to be abused. PAP invited them into Singapore, and if you have the cheek to ask them in, then you jolly have some basic decency to take care of them. Otherwise, you manage your flow better. Why does this government allow Singaporeans to lose our moral character because of bad policies that you cannot even plan properly? Now, this government allows the conversations of the people to degenerate into bad mouthing one another, and this government doesn’t even come out and apologise for the bad policies that they had implemented, which has resulted in Singaporeans feeling so stressed that they have allowed themselves to speak badly of another. Where is the human decency and humanity of this government? Singaporeans, please, if our government is unable to maintain their respectability and their standards, at least we, as a people, should have a decency to speak up and stand up for what is right. The right thing to do is not to get angry at the foreigners, or to get angry at one another. The right thing to do is to refocus our attention and direct it at the perpetrator – this ineffective government. Now, let me be clear – who was it who started talking about the “Singaporean core”? Who was it who started talking about increasing the population of Singapore to 6.9 million, such that there will be over-crowding in Singapore? Who was it who wanted to grow Singapore at all costs, while pretending to want to keep a “Singaporean core” in 2030, which by 2040, will no longer be the “core”? It was not Mr Low Thia Khiang. Mr Low Thia Kiang had to speak up in parliament to protect the people on this island from over-crowding. And thus he suggested slowing down the pace of growth in the first decade, and then increasing the pace of growth at a moderate rate in the subsequent decade, when the infrastructure has been increased after the first decade. Mr Low wanted to do what was right to protect Singaporeans, foreigners and anyone who will reside on this island. Who was it who didn’t bat an eyelid as to how bad the situation might be in Singapore but then, only because of the pressure put on them by Singaporeans, passed a separate motion to ask Singaporeans not to focus on the white paper, and started discussing about how perhaps, we need to look into building up the infrastructure first, before we talk about the population projection? It is Mr Li Yeming who has gotten his facts terribly wrong. Perhaps Mr Li might not have known better, but why would he? Mr Li is from the Singapore Federation of Chinese Clan Associations. Have you taken a look at their website? 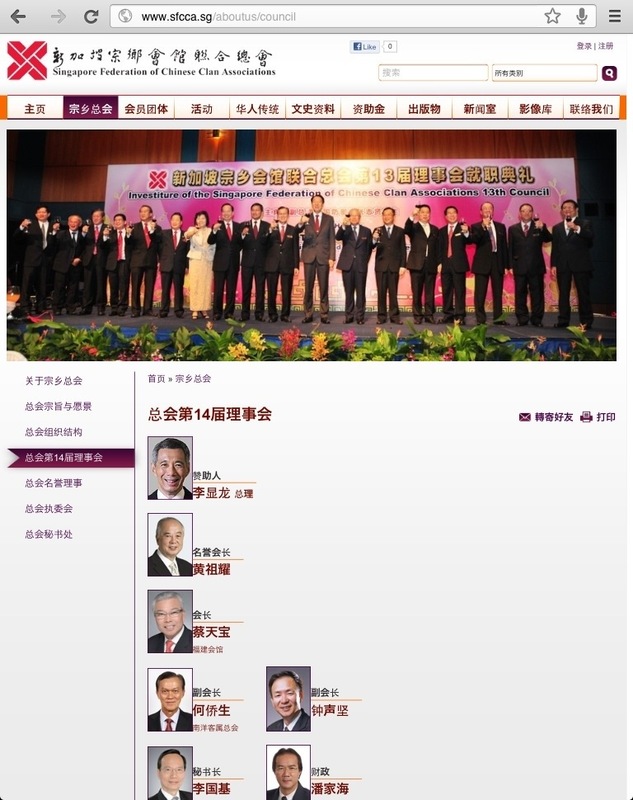 On their website, PM Lee Hsien Loong is the patron of the Federation of the 14th session of the Governing Council. The federation is also very proud to display pictures of our PAP politicians, such as DPM Teo Chee Hean, Vivian Balakrishnan and President Tony Tan. Now, where is PM Lee, DPM Teo, Mr Balakrishnan and Mr Tan when Mr Li from the Singapore Federation of Chinese Clan Associations had decided to send this letter of accusation to Mr Low Thia Kiang? Now, I ask of my fellow Singaporeans, who is it who is holding different political views and who is dividing our society now? Who is the one who is inciting the people of different nationalities? Are we Singaporeans protesting against PAP’s population and economic policies because we are “against national interest”? Clearly, PAP is the one who is against national interest by pushing through policies which harm the large proportion of the people living on this island. As I have said before, this government is not interested in protecting the rights of the people. This government is interested in seeing the people on this island degenerate into bad mouthing and mudslinging. The more you do it, the more it takes the attention away from them. And so, now, Mr Li Yeming from the Singapore Federation of Chinese Clan Associations has also been thrown into the fray to add to the divide and rifts that is already tearing Singapore apart. May I remind you that for many associations and clans in Singapore, they have ties with this government. May I remind you that The Straits Times is also a mouthpiece of this government, without nary a sense of pride or integrity. 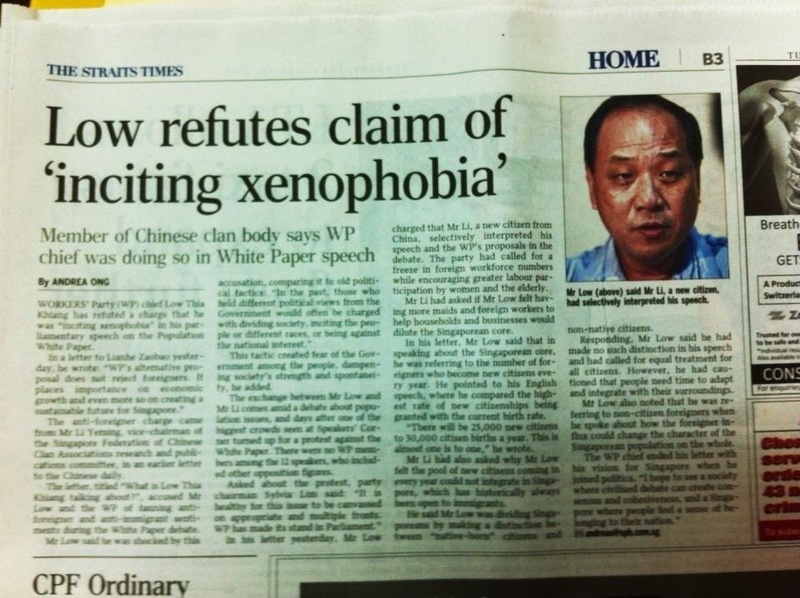 And now, we have seen it for ourselves how this clan and this newspaper has sold their morality and soul to the government by reporting on a fellow Singaporean who, they claim, is inciting xenophobia, when Mr Low isn’t even the one to first speak of the “Singaporean core” or the 6.9 million population. Mr Low is not the one inciting xenophobia. Rather, the accuser is. Right now, Mr Low and the Worker’s Party hold the high moral ground among the people in Singapore. After PAP’s disastrous showing at the Punggol East by-election and their unsuccessful attempt to sway the people to buy into their population white paper, and with the protest against the white paper over the weekend well-attended by a few thousand people in Singapore, PAP is starting to feel anxious and nervous once again. What better way than to find ways to compromise on Mr Low’s integrity? 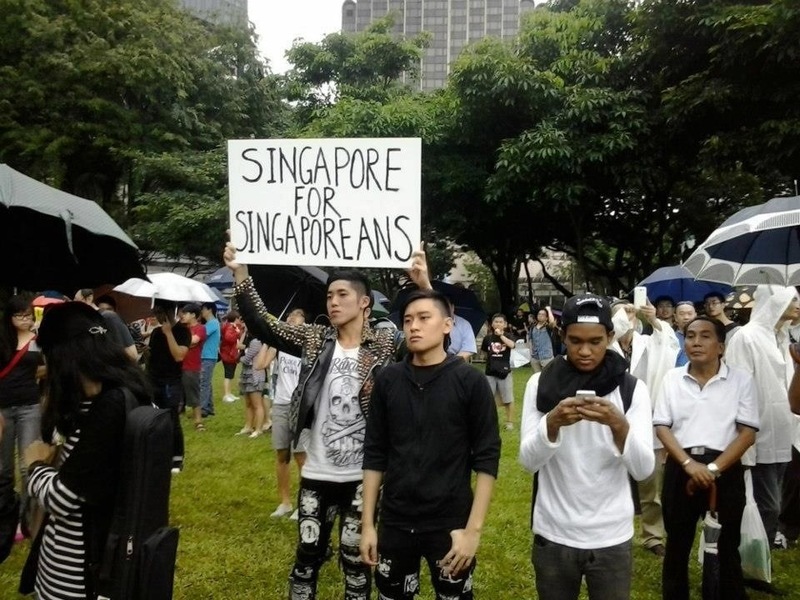 At the protest over the weekend, an individual had held up a signboard with the words, “Singapore for Singaporeans”. There have been many discussions ongoing about how this individual might also be displaying xenophobic sentiments. Singaporeans, I will be wary to jump into conclusions. You have to understand that at the current state of mind that many people in Singapore are in, there is a careful cautiousness that pervades the people, because of the current sensitivity of how the issue of Singaporeans and non-Singaporeans is being discussed. If this signboard was held even 10 or 15 years ago, would it have thrown up such divisive sentiments? Now, I have spoken to this individual and I know where he is coming from. 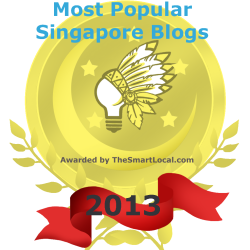 I myself have written in one of my articles about how we need to build a Singaporean Singapore. Why do we say that? In light of the current context, many people will be fearful of fanning xenophobic sentiments, and thus the words we use or the things we say can be held accountable to doing that. Rightfully so, this means that we need to be even more cautious in the way we express ourselves. As a responsible and thoughtful society, we should ensure that we respect the rights of others. In this context, the choice of word use to describe a “Singaporean Singapore” might not be the most enlightened. But, please allow me to explain. I share this individual’s understanding of the matter because when we talk about a “Singaporean Singapore”, this is talked about, in comparison with a “PAP’s Singapore”. I do not want a Singapore where PAP makes all the decisions and where this Singapore is sculpted by the one-side or 80-sided PAP politicians. I want a Singapore where all Singaporeans have a voice in making Singapore the Singapore that we want to live in and where we can call home. When we talk about a Singaporean Singapore, we are talking about all citizens who have a right to vote, who get to have a stake and a say in this country, and who get to make decisions for ourselves, and where we do not want to have our rights taken away by the 80 PAP politicians, who believe that we should be the ones dictating how our lives should be, and by the PAP. This is the context that this is talked about, and as I understand, how the individual feels. There are many ways to look at a situation, and the words that have been used, “Singaporean Singapore”, are used in the context of our electoral and citizenry rights. Does that mean as a Singaporean who gets to decide the fates and fortunes of our country, that we get to slight others who are thus not Singaporean? If we were to think so, then I would be terribly embarrassed. True, in light of the ongoing discussion, the choice of “Singaporean Singapore” might be poor word choice which I would most likely not use in my subsequent articles, because I do not want what I say to be misconstrued, because of the many interpretations that can occur. But let’s be clear. I think at this point, many of us have an amazing awareness of how we need to be careful in our thoughts and attitudes, as I have, and as this individual in question has as well. But the positive outcome of this episode is that in this discussion and in a discussion which the protest at Hong Lim Park on Saturday was able to refocus onto, everyone on this island has to be cognizant that we shouldn’t be directing our unhappiness at anyone individual, be it a Singaporean or foreigner, or people of any other identities or characteristics. It is clear that the current situation that we face in Singapore now is due to bad policies and a government which refuses to apologise for the bad policies and a government which continues to fan nationalistic sentiments and divisions. This government had started the use of the idea of the “Singaporean core”. This government has not stepped out to apologise for the xenophobic sentiments that they have caused by the usage of this terminology. And this government has not stepped out to recognize the upset and divisions that they have caused to a large population of Singaporeans, but continue to slight the people as being significant. This government doesn’t want to take the people seriously, because it continues to think that it knows what right and will continue to play divisive politics where it can. This is a highly irresponsible and reprehensible government which should be ashamed of itself and its own doing, and soon-to-be undoing. 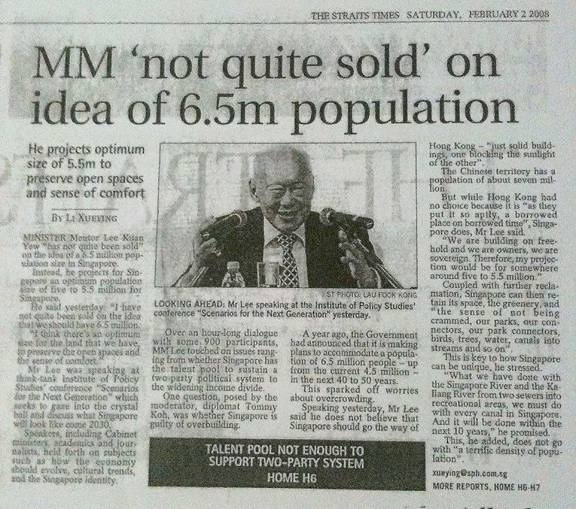 Mr Lee Kuan Yew had said in 2008 that he believed that the optimum size of the population in Singapore should be 5.5 million, so that we can “preserve the open space and have a sense of comfort”. Perhaps our current ministers have so big a salary and a house that their open spaces are so well-preserved in their bungalows that they believe that they have achieved the sense of comfort that they need, that other Singaporeans can be thrown into small living spaces of 60 or 90 square metres, without needing a sense of comfort. I think we can see for ourselves who the leader of this country truly is. There is/are prominent site(s) guilty of inciting xenophobia, by blowing up singular incidents as though they reflect the common (mis)behaviour of specific groups. I’m sure you’re aware of the ugly site(s). This is an inconvenient truth that you must face squarely. The only way to defend your claim is to stand up against such hideous sites. I agree with you. There are people who continue to discriminate. What we can do is to continue to educate and raise awareness, so that we can help others understand better. We need to be aware, and we also need to have a focus on what we hope to attain – where more and more people are aware, and this is what this blog hopes to do. “This government has bad planning, bad foresight and bad policies – now, let’s get this right, please”….you said. I can’t say that I agree with you! Every coin has 2 sides – I would say that the Singapore govt has plan well, incredible foresight and good policies (that will served them well in the future!) Why? you asked? This govt has plans to rule in perpetuity. The way to do it is to increase the intake of new citizens, make them beholden to PAP & use them for future GEs. The current 60%+ Singaporean electorate that vote for PAP in GEs will diminished over time as death from old age, disillusionment and migration reduce this majority to below 50% or less. Some have calculated that the native Singapore electorate will be reduced to less than 40% if the White Paper numbers are implemented. Over a period of 17 years, foreigners adopting Singapore citizenship will make up over 60% of the electorate. This is good for them but will be bad for Singaporeans. This is not a wake-up call but it is a call for action before it is too late! This govt has moved from a social govt to an extremely good monetary speculator. A lot of Singaporeans bashed up Mah Bow Tan for sleeping on the job while as Minister of National Development. Bullocks! he was withholding HDB stocks in order to move HDB prices to new highs. The govt had the statistical information with regards to immigration as well as citizenship grants – they would have known that HDB prices had no way to go but up! Similarly, COE prices went up as the number of COEs available went down and the number of wealthy, well-heeled investors took up Singapore citizenship. How is it a China-man can afford an expensive Ferrari? Not until he crashed it against a COMFORT cab! The IRs (casinos) were also an incredible move by the govt – it kick started our moribund economy to sky high levels. The IRs also kick started the property market with Sentosa Cove developments. This govt is geared to making money at everyone’s expense!